You know those people who are always up for doing something crazy and adventure-sporty? These are the guys that leap at the opportunity to swim a mile through ice water or base jump off the Grand Canyon or hustle to do some other endurance sport in unkind conditions. Well, what can I say. I’m so not that guy. Except today I was that guy a little bit. Today’s agenda was once again in three parts. There would be some activity in Punakha, followed by a three hour drive, followed by some activity in my destination, Gangty, where I would be for the next two nights. I was thinking maybe some bird watching or perhaps having tea with villagers. Instead, I let myself get suckered into white water rafting. 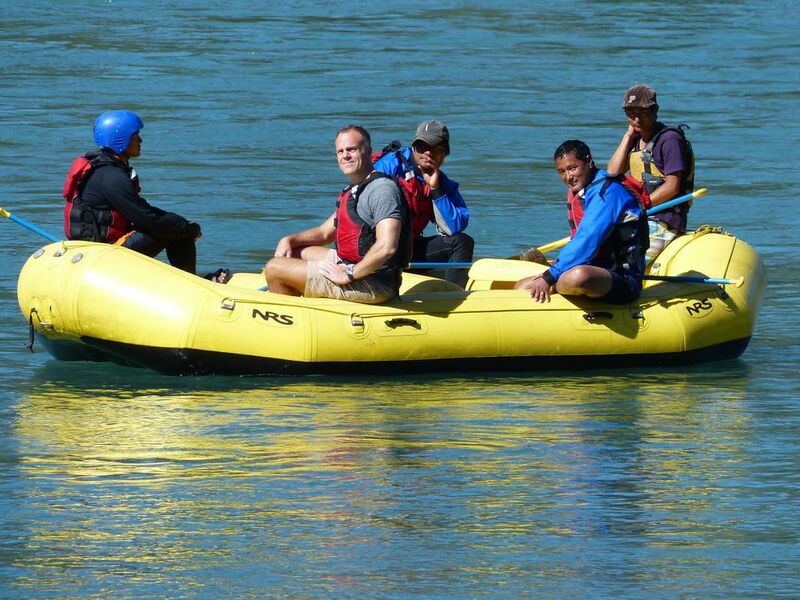 Seriously, what genius would willingly go into a glacier fed river in Bhutan in November? Apparently me. I found myself with four guys from a local rafting outfit with one other guy on kayak rescue duty. They innocently suggested that I might enjoy the view from the front of the raft, and I gullibly accepted. It wasn’t until we were on the water that the guy steering the raft started to laugh and say that he was looking forward to getting me as wet as possible. He even thought the idea of me getting tossed out of the raft might be kind of fun. He then told me that the water was 4 degrees celsius (40 degrees F). Off we went merrily down the Father river. The conditions weren’t very rough as the water begins to slow by November (summer is their biggest water season), so the most we saw were Class III rapids. However, the captain of the raft was quite good at getting water into my side of the raft and into my shorts. Over and over and over and over again. At one point, he gleefully announced that they were going to rename one of the rapids in my honor. They were going to call it the “Shrink your XXXX’s” rapid. Ha ha ha ha. These guys seriously needed to find new outlets for their sense of humor and stop picking on big dumb guys like myself. When I wasn’t getting water torture by my raft mates, I took a moment to contemplate that I was in the middle of nowhere with four guys from a completely different country and culture from mine. I listened to them joke and rib each other as well as me. I listened to their 20 year old guy humor. They were EXACTLY like every 20 something American I’ve ever met. Different ethnicity, language and customs, but same underlying dude behavior. It was another example of how much we are all so much the same despite all of our cultural differences. Degenerates! Very mean to tourists!!! But also very funny. After I dried out, we jumped in our car and spent the next three hours winding through the single lane semi-paved highway that connects East with West in Bhutan. One day this country will get a proper highway and they will wonder how they ever lived without it. I’m not being critical, by the way. It’s hard to imagine the scope of building a multi-lane highway that carves through an endless sequence of hills and mountains. After all, it is the Himalayas. Speaking of Himalayas, this leads me to part two of ill-advised outdoor activity. I was offered the opportunity to get out of the car early with my guide and hope onto mountain bikes to complete our trip to the next lodge. Dumbly, I said “that sounds awesome!” and my fate was sealed. Hence began a 1,000 meter climb on a mountain bike on that same frightening single lane highway. The climb was made all the worse by the fact that the summit would be at 3,300 meters (10K feet), so altitude and temperature would not be my buddies. I thought I was in decent shape, but I was feeling it. I found myself relegated to the “are we almost there yet?” pleading. However, as is the case every time I have ever tortured myself to reach the end of a painful goal, I was euphoric when we reached the top. I then had a nice 20 minute, albeit chilly, descent into the lodge. I arrived cold but happy, and I’m now writing this in my toasty room feeling very self satisfied. It’s been a cold, huffing and puffing day, but an excellent one. It’s funny how pushing ourselves qualifies as an excellent vacation. Or is that just me? Maybe I am an adventure man.